Compared to last year, when Egypt reported more than 160 human H5N1 infections between Nov 2014 - April 2015 (see WHO EMRO: Updating H5N1 IN Egypt), Egypt has had a pretty mild 2016, with just 5 infections reported between January and mid-May. The last case was reported in the first half of May, involving a 50 year old man from Dakahlia. Since then, despite numerous reports of massive poultry die offs, Egypt's MOH has been silent on the issue of human cases. Of course, Egypt's MOH website is rarely updated (their bird flu FAQ still lists 180 cases and 65 deaths, numbers that were current 2 years ago). Between a largely silent MOH, and a government clamp down on reporting by the Arabic press, getting good information out of Egypt has become increasingly difficult. 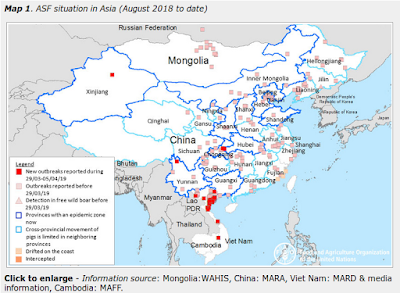 Today, however, the World Health Organization has published (h/t Lisa at CIDRAP News) their July Influenza at the human-animal interface report which lists 3 new H5N1 Egyptian H5N1 cases since late May. Since the last update 3 , three new laboratory-confirmed human cases of avian influenza A(H5N1)virus infection were reported to WHO. A 2-year-old male resident of Cairo Governorate, Egypt, had onset of influenza-like illness (ILI) symptoms on 30 May 2016, and a sample collected as part of ILI surveillance tested positive for influenza A(H5N1). The case was hospitalized, treated with antivirals for pneumonia and recovered. Prior to his illness, the case had visited a family member who raised birds. In addition, a 30-year-old woman from Menia Governorate had onset of illness on 11 June and an 8-year-old girl from Cairo Governorate had onset of illness on 18 June. Both cases had exposure to poultry or poultry-related environments prior to illness, were hospitalized with pneumonia, received antiviral therapy and have recovered. Investigation and follow up of contacts of the three cases took place for 14 days with no further cases reported. Avian influenza A(H5N1) viruses are enzootic in poultry in Egypt. Despite sporadic human infections by novel viruses around the world, we have seen no sign of efficient human-to-human transmission, and so the WHO's risk assessment (below) remains unchanged:. Risk assessment outcome: The overall public health risk from currently known influenza viruses at the human-animal interface has not changed. Further human infections with viruses of animal origin can be expected, but the likelihood of sustained human-to-human transmission remains low.